Brilliant Australia sprinter Shamexpress, the fastest son of outstanding sire O'Reilly, has been secured for a syndicate headed by Windsor Park Stud and will commence stud duties at the renowned New Zealand nursery this spring. A Group I winner of well over A$1million, including the VRC Newmarket Handicap at Flemington, Shamexpress follows champion sires Exceed And Excel and General Nediym as 3YO winners of Australia's premier sprint race. Successful on debut as a 2YO at Flemington, Shamexpress trained on at three and four years to win at Gr.1 level and be multiple Gr.1 placed at Weight For Age, including this season when finishing runner-up in both the Lightning Stakes and Sprint Classic. 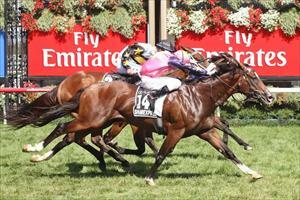 In addition, Shamexpress finished third in the Gr.1 Coolmore Stud Stakes (Ascot Vale Stakes) as a 3YO. Shamexpress was trained throughout his career by leading Australian trainer Danny O'Brien, who commented: "From the time he first stepped onto the racetrack, Shamexpress was one of the most naturally gifted gallopers I have ever trained. He confirmed that when he won at Flemington on debut, breaking 33 seconds for his last 600m and did so again when winning the Gr.1 Newmarket. He's absolutely one of the most impressive individuals you could wish to see”. Windsor Park Stud co-owners Nelson and Rodney Schick inspected Shamexpress in Melbourne last week and were very taken with him. "After viewing Shamexpress I could not be more excited about him. He's a beast of a stallion, with the physique and strong genetic profile necessary to be a success. As with his champion sire O'Reilly, Shamexpress was a Group I winner over 1200m as a 3YO against older horses, a fact that also appealed a lot to us,” said Rodney Schick. Shamexpress is one of only two Australian Gr.1 1200m winners among 75 stakes winners sired by O'Reilly and through his dam is a grandson of Windsor Park's former eight time champion sire Volksraad, whose daughters are now proving so successful at stud. His granddam Rose World, by champion racehorse and sire Grosvenor, is a granddaughter of Gr.1 Irish Oaks winner Celina and a member of the renowned No.9 stallion producing family of Commands, Kaapstad, Nasrullah, Royal Charger, Tudor Minstrel and Fair Trial. "We're syndicating Shamexpress and the response from breeders has been terrific, enabling us to secure him for the NZ breeding industry. He will be a popular addition to our stallion roster at a service fee of $16,000+GST,” remarked Schick.